There are a lot of indoor exercise bikes currently available on the market however very few of them will satisfy the needs of a spin bike enthusiast. The recumbent or upright bike just does not challenge a fitness fanatic in the same way a spinning bike does. The spinning bike is most like a real bicycle and you can lean yourself forwards and lift your rear off the seat to increase the intensity of the work out. How does a spinning bike work? A spinning bike is designed to hold your weight and rapid cycling motion as they are built with a sturdy frame and a special wheel design. The wheel is attached to a weighted fly wheel which is in turn attached to the pedals. 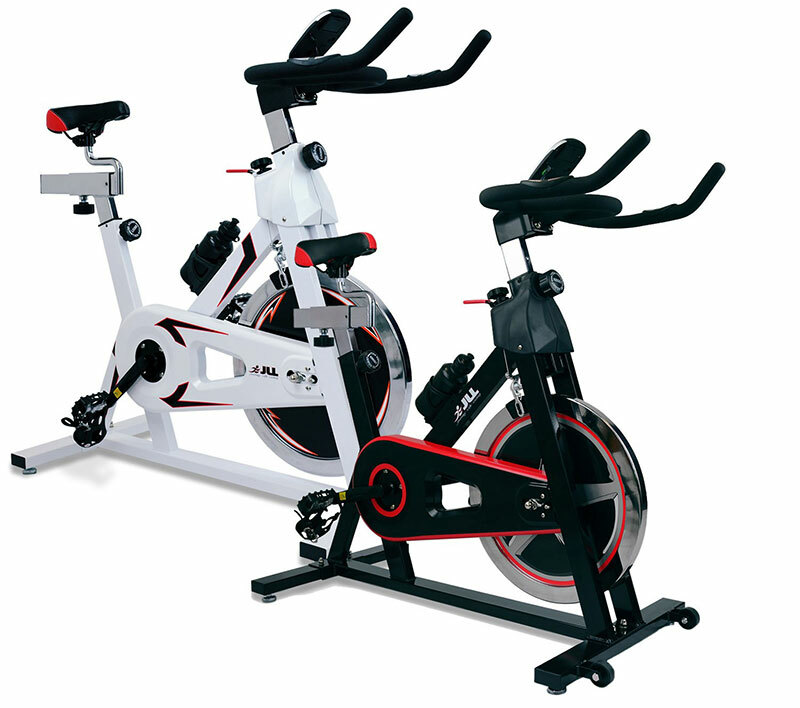 The tension on a spinning bike is variable and can be controlled by a knob on the frame. To make the most of your workout alter the resistance and your cycling position so that it can mimic the outdoors. Riding at a slightly elevated position with your bottom of the seat will intensify your work out and improve you cardiovascular system and endurance levels. The IC300 exercise bike is an advanced piece of exercise equipment ideal for those looking to challenge themselves harder. The IC300 stationary bike is durable, smooth and quiet due to the fact it is chain driven; this system ensures a constant and precise workout that can help tone and sculpt your muscles. 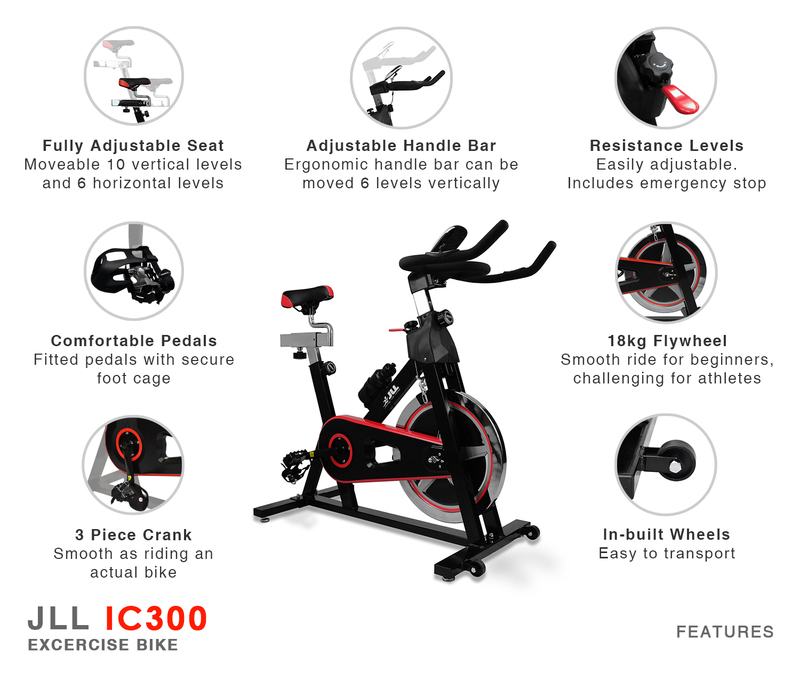 The JLL IC300 Exercise Bike is a direct chain driven bike that can be pedalled both forwards and backwards so this stimulates the feel of riding a real bike. The seat is fully adjustable and can me moved both horizontally and vertically to suit the height of the rider. There is a heart rate sensor built into the handlebars for you to keep a track of your vital statistics. The LCD monitor also displays the speed, time, distance, calories, odo and has a scan mode. The JLL IC300 also comes in two different colours either black or white. The cold days and dark nights don’t affect when you work out in your own home. You can exercise at a time that is suitable for you and for how long you want. The bike can be used by multiple members of the family. It is a one off payment so no more gym memberships that increase each year. Regular exercise can will increase your fitness levels and general wellbeing. I am 33 and have two dogs that keep me active and fit. I love to explore the outdoors and I’m always looking for new ideas to add fun to my fitness regime. Next story Cyclers, know your vitamins! Losing Weight Vs Losing Body Fat. Skipping… Don’t Skip Skipping Day! © 2018 JLL Fitness . All Rights Reserved.